They said the world would end in 2012. They never said it would end like this. Dakota Travis and his neighbor Steve Earnest have been hiding out in a fortified apartment in the month following the zombie apocalypse, but when a rogue gang uproots them and chance brings one of its members into their midst, there is little the two of them can do but run. They find sanctuary in a converted asylum with members of the United States Army, and while things seem to be safer than before, an underlying strain of tension begins to rule their lives as Sergeant Armstrong, leader of the small military troop, begins to succumb to insanity, while Dakota slowly begins to find himself becoming attracted to one of the sergeant’s men, a sin that not only transcends traditional military policy, but the moral boundaries of happiness after tragedy terrible enough to destroy the entire world. 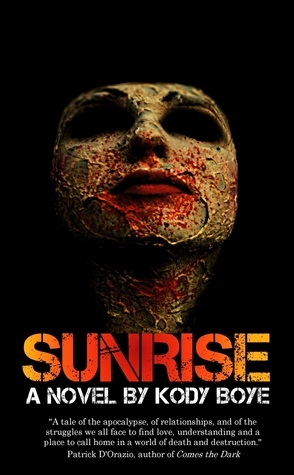 In a world of the undead, the fierce, the savage and the unthinkable, who can hope to survive one final sunrise? Sunrise follows the story of a young man on a journey to out run zombies and save his life. Dakota is holed up in an apartment with his best friend Steve. The men are forced from their safe haven by a gang. They travel many miles and avoid and kill zombies along the way. Dakota also finds love and a family he never had. Dakota is a very likeable MC. He’s not like most zombie novel heroes. He’s not a badass super hero. He’s just a regular guy that knows how to shoot a gun and run for his life. He’s not tough as nails nothing can break me type of guy. I LOVE that about him. He is a guy I can relate too. Although I am sure I would have peed my pants in a lot of the situations these guys got themselves into. Steve is an amazing guy and anyone would love to have him as a bestfriend. Kody Boye knows how to write vulnerability. He really gets the human condition. In most end of the world novels we don’t see the hero cry ever. Dakota sheds lots of tears. Over big and sometimes little things. I respect that Kody included this. He opened himself and his charcter to be viewed as weak because his gay character cries. Don’t think I am being harsh. I am not. I live in a small redneck town in Iowa. I see and hear enough comments to know that gays are no where close to being completely accepted. Hell, I’m not even sure if some people around here have even heard of the civil rights movement. There were moments of humor in this work. They were very subtle and not all readers might catch onto them. There are moments that will break your heart. There are moments that will make you jump up and go YEAH!!!!! Jamie–sigh. He’s a guy any girl (or gay man) can fall in love with. Oh did I mention that the MC is gay? I did? It doesn’t matter to me at all. This is a book about finding love and hanging on to life no matter the odds. When others turn to raiding, killing, and taking–these guys are about helping everyone and just finding joy in a dead world. Do not going into this book expecting a horror novel. It is not. It’s a survival novel. There are zombies but they are just a situation that the characters must evolve and move around. THEY are not the stars of this story. LOVE and LIFE are. I am so glad I decided to read this book. It has gotten me out of my book slump and back on track. What a fantastic novel. I cannot gush enough! Kody Boye is an author that I will keep my eyes on in the future. It took me a while to get into this book. I cant even really pinpoint why, but it did. I would say halfway through I started really getting into it, and felt that connection with the characters. Overall it was a pretty decent zombie novel. There was not as much violence, gore, and action in this book as there are in most zombie novels. However I read the author note at the beginning of the book and he stated that this wasnt written as a traditional zombie novel per se, but it was written for the gay community. So while some may be upset at the lack of killings, I was not. This was a very heartfelt book. The author didnt hold feelings back, he put it all out there in the pages of his book. I enjoyed that honesty.